A performance by the Kgethi Nkotsi Quartet at The Jazzy Rainbow on February 4 will be part of the Concerts SA Venue Circuit. Kgethi Nkotsi was born and raised in Tembisa, Johannesburg. He started playing the trombone four years ago at the Moses Molelekwa Arts Foundation. He moved to Durban last year to pursue his music career further by studying music at Howard College UKZN. He was able to jam and play music together with the people he looks up to musically, like Professor Salim Washington, Neil Gonsalves, Mandla Mlangeni and Dalisu Ndlazi to name a few. 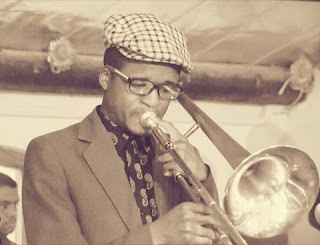 Nkotsi has formed a band in the meantime in his function as a trombonist, because he got inspired by his favourite trombonist, Curtis Fuller, leading a band which is rare. Nkotsi will play his favourite jazz standards and some of his own compositions, while he is accompanied by Freeman Gumede on bass, Zoe Molelekwa on piano and Stanley Matlou on drums.